Welcome to the official site of the FunkeyMonkeys! Created by Joshua Sitron, composer for Nickelodeon's Dora the Explorer, the FunkeyMonkeys are a supergroup of professional musicians, comedians, and teachers, based in New York City, who produce eclectic records and live shows for kids and parents. Think '"The Muppets in Free to Be" or"Seinfeld meets the Wiggles" or "Herbie Hancock's Vaudeville Bar Mitzvah". On this site you can learn more about who we are, hear and buy our music, watch video, buy tickets for live shows, and contact us. Go Bananas! Nine electric, and electic albums for family fun. Featuring some of NYC's best musicians. 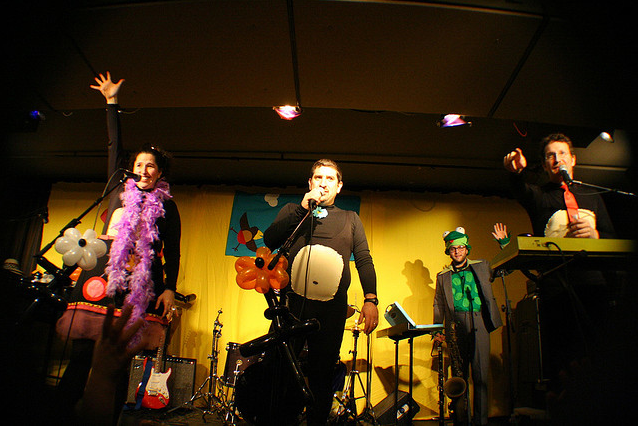 Performing mostly in and around New York City with occasional trips around the country, the FunkeyMonkeys are a musical and comedy experience. A 4 to 10 piece band, skits, variety of all sorts. No two shows are identical and improv is the name of the game. Check out Photos and Publicity images, as well as videos. The FunkeyMonkeys made a number of videetos back before YouTube existed.